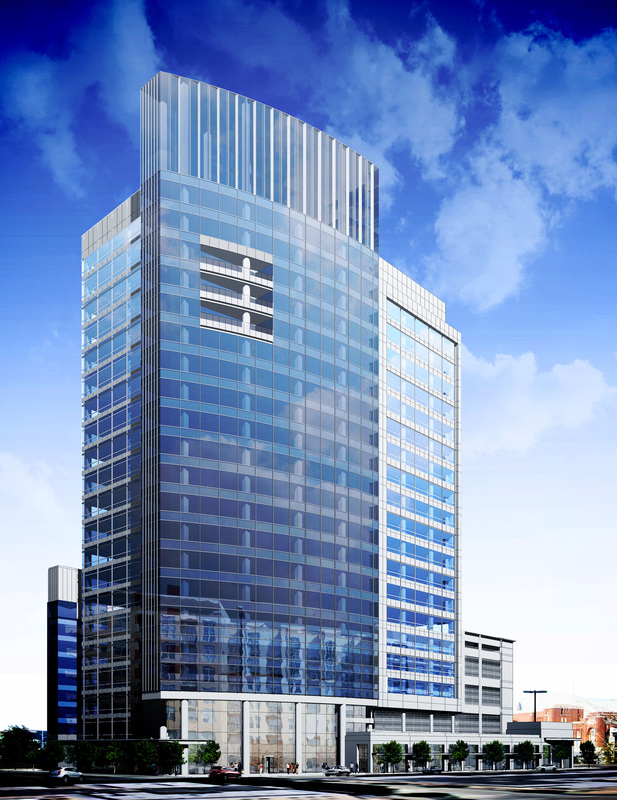 The new Victory Park tower is designed as a "next generation office building" by BOKA Powell. This new Victory Park building will be a trend-setting structure ... this is an opportunity for a company to lease space ideally suited to their needs," said Don Powell, BOKA Powell. BOKA Powell has created a next-generation adaptable design for the new 400,000 square foot, Class A office tower at the Victory Park mixed use development in downtown Dallas, working with commercial real estate development and investment firm KDC. The 23-story building, consisting of 14-plus floors of office space above an eight story parking structure, is designed to meet the needs of a range of potential tenants. Specifically, the innovative tower design will accommodate a wide variety of floor plate sizes, ranging from 25,000 to 54,000 square feet, the size of a large trading floor. 1) An energy efficient “green” design incorporating 10-foot ceiling heights, allowing for more natural daylight than typical nine-foot ceilings. 2) High efficiency mechanical and electrical systems. 3) LED lighting systems incorporated throughout the building. 4) An innovative elevator control system that reduces the number of hoistway openings, while simultaneously achieving faster service. BOKA Powell is currently working with potential tenants on preliminary office layouts. Construction is expected to begin this fall, with anticipated completion in late 2014. 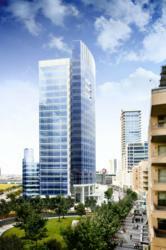 KDC will pursue LEED® certification from the U.S. Green Building Council for this project. “Victory is the only development of its kind in North Texas that offers everything for tenants including great access, proximity to one of the best sports venues in the country, the W Hotel, upscale urban housing options, and great restaurants. We are very excited about the interest we have had in the building,” said John Brownlee, Senior Vice President of KDC. The new office tower will be located across from the park at Victory between Museum Way and High Market Street, and its entrance will face Victory Park Lane. Building amenities will include an upscale restaurant, delicatessen and a fitness center. A large park and more than 16 restaurants are within walking distance. Victory Park is a 75-acre mixed-use urban redevelopment surrounding American Airlines Center, home of the Dallas Mavericks and Dallas Stars. It is located in downtown Dallas at the intersection of Interstate 35, the Dallas North Tollway and Woodall Rodgers Freeway. Amenities include the W Hotel, House of Blues and Hard Rock Café, as well as urban residential and retail. BOKA Powell is a nationally recognized architectural design, planning and interior design firm, with office locations in Dallas, Fort Worth and Austin, TX. BOKA Powell’s areas of focus include commercial office, health care, higher education, hospitality, multi-family and mixed use planning and design. BOKA Powell designed the 17-story One Victory Park in 2008, which was Dallas’ first multi-tenant office building with a pre-certified LEED® Silver designation. Click here to read Don Powell’s white paper on the “pillars of design” for office buildings, published in Urban Land magazine in September 2011: http://www.bokapowell.com/strategies/an-architectural-perspective.pdf. BOKA Powell has created a next-generation adaptable design for the new 400,000 square foot, Class A office tower at the Victory Park. The new Victory Park tower will be located adjacent to amenities including the W Hotel and the American Airlines Center.